Our "30-is-the-new-20" culture tells us that the twentysomething years don't matter. Some say they are an extended adolescence. Others call them an emerging adulthood. But 30 is not the new 20. 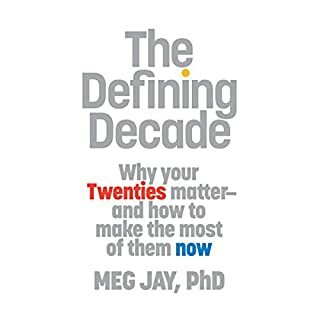 In this enlightening book, Dr. Meg Jay reveals how many twentysomethings have been caught in a swirl of hype and misinformation that has trivialized what are actually the most defining years of adulthood. What did you like best about The Defining Decade? What did you like least? There were some interesting views on what you should be thinking about in your twenties however much of the content seemed very ABC basic life stuff. What stands out the most in my mind is the section where Meg Jay talks about the strength of weak ties. Essentially this concept states that a acquaintance (weak tie) has the ability to change your life (For example: someone you met once at an event who works for another company where you are looking to get a job.) As a twenty-something a few years out of college and into my career I can not stress how true this concept really is; networking can do wonders for your career and the same can be said if you are self employed as well. I purchased this book because I read a few rave reviews stating that the content was critical to anyone in their twenties. I thought that sounded fantastic and I went into it expecting details and opinions on how you can set yourself up for success in the years that come after your twenties. I quickly realized that the book was not about any of that stuff. If you are in your mid to late twenties and you have an established career that you enjoy, a serious relationship, and have investments or retirement accounts set up, I would recommend that you NOT buy this book. If you feel like you are lacking in one of those areas and want a little kick in the but then this might be your book. What aspect of Meg Jay’s performance would you have changed? Typically books that are narrated by the author are my favorite, however this might be an exception to that rule. Unfortunately most of the book is read in a very dull tone and evoked the feeling that the book was dragging on. The dialogue was sometimes slightly confusing because there was no change of tone between the two characters and the writing did not include any clues either(she said, he said, ect.) Overall the performance was OK for this type of material. Overall this book left me with an overall message that goes as follows: "Stop partying, stop living for today, stop sleeping around, start looking toward your future, look for a person to marry and look for a good career. Its time to grow up." and perhaps this might be an important message for many people in "my" generation. If you are a young professional that is well established on a life track (job, house, spouse, retirement, investments, ect) then I would skip this book, it will feel like a drag.